Brandenburg Gate - Today Berlin is the largest city in Germany. But 17th century, shortly after the Thirty Years' War, it was only a small fortified town; not nearly as old or large as a city like Munich, which was the capital of Bavaria. But with the establishment of the Kingdom of Prussia, the Hollenzollerns made Berlin their capital and from that point, the city began to flourish. By 1734 the fortress was demolished, partly to make room for the expansion of the city, and partly because it was considered secure enough not to have to be protected anymore by walls. 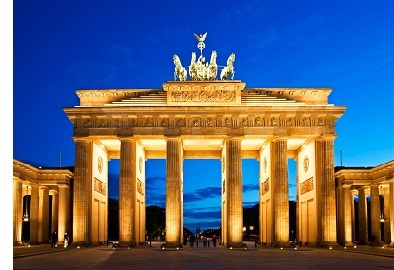 In 1788, King Frederick William II (successor of Frederick the Great) commissioned the Brandenburg Gate and dedicated it as a monument to peace. Completed in 1791, it was the most famous of 18 gates by which the city could be entered, and today is one of Germany's most famous landmarks. Beginning in the mid 18th-century, the West underwent a neoclassical movement and the Brandenburg Gate is one of the finest examples of neoclassical architecture. It consists of 12 Doric columns and is crowned by a horse drawn chariot known as the Quadriga. The designer was Carl Gotthard who drew his inspiration from the Propylaea on the Acropolis of ancient Athens.